The Boy and the Beast is the latest film from director Mamoru Hosoda, whose previous works include The Girl Who Leapt Through Time, Summer Wars and Wolf Children, which have made Hosoda one of Japan’s most acclaimed animation directors. Like the three aforementioned films, The Boy and the Beast won the Japanese Academy Award for Animation of the Year (Japan’s equivalent of the Best Animated Feature Oscar), further cementing Hosoda’s legacy. 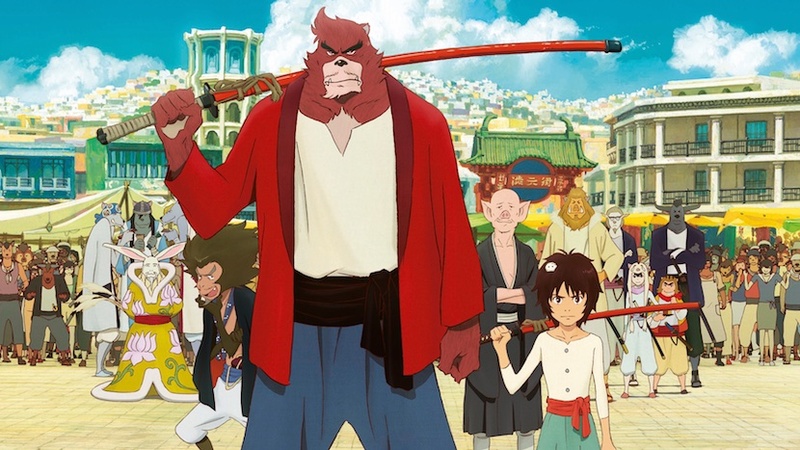 It isn’t simple redundancy that The Boy and the Beast gets such praise, however. Despite a few dips in pacing midway through, The Boy and The Beast is a real charmer. The story centers on a young boy named Ren who, after his mother passes away, runs away to avoid living with his relatives (his parents were divorced, and he doesn’t know the whereabouts of his father). During his time on the streets, Ren encounters the wandering beast-man, Kumatetsu, a large anthropomorphic bear-like figure. Kumatetsu (somewhat jokingly) offers Ren to become his apprentice. Although Ren is resentful of just about everyone due to the recent happenings in his life, he ends up following Kumatetsu out of curiosity, and ends up lost in the Beast Kingdom. As it turns out, the lord of the Beast Kingdom is to surrender his crown, as he soon plans on reincarnating as a god, but has yet to decide on what he wants to be the god of. While the Beast Lord procrastinates his decision, there are two top contenders to take over his position as lord once he ascends: One of them is Kumatetsu, who is lazy, grumpy and a bit of a brute. The other is Iozen, a boar-man who is wise, gentle, and already has two apprentices in his sons. Kumatetsu and Iozen are to duel each other, with the winner being declared the new Beast Lord (their rivalry is a friendly one, and it is the law of the Beast Kingdom that all swords remain sheathed even in combat). Between the two, Iozen seems like the far more likely candidate, and Kumatetsu believes finding an apprentice will help him better himself. Now stuck in the Beast Kingdom, Ren becomes Kumatetsu’s rebellious apprentice. The boy doesn’t share his name with Kumatetsu, so he is renamed “Kyuta” by the beast-man. Though Kyuta is a less-than ideal student, and Kumatetsu a less-than ideal teacher, the two share many similarities in their history and personalities, and begin to gain a stronger understanding of one another as time progresses. The story has a lot of charm to it, serving as an imaginative coming-of-age story that also has some deeper subtext. It’s also a testament to Japanese animation’s ability to appeal to all ages, as it’s easy to imagine the film keeping younger audiences entertained while also winning the interest of the older crowd. 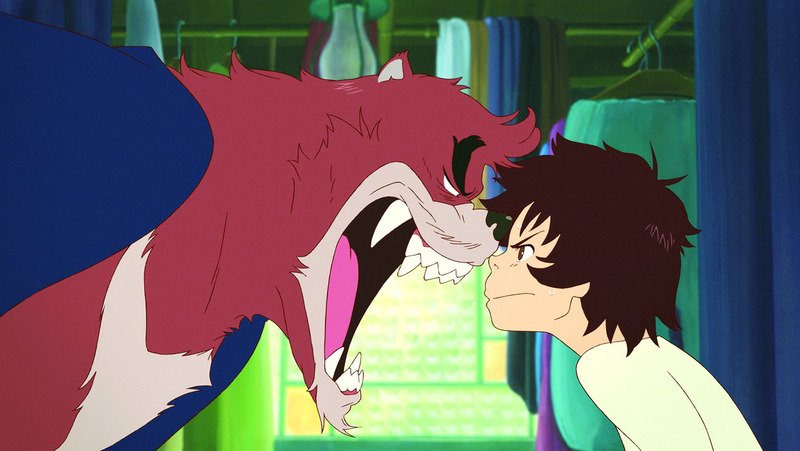 The Boy and the Beast also takes a number of cues from classic animated films like Disney’s The Jungle Book and Hayao Miyazaki’s Spirited Away (the first few minutes that Ren arrives in the Beast Kingdom almost play as a love letter to Spirited Away’s opening, right down to the main character receiving a new name). And both Ren (or Kyuta, whatever you want to call him) and Kumatetsu may both be hard-headed, but both their strengths and flaws ultimately make them more than capable of winning the audience over. The film is also exquisitely animated. It’s absolutely beautiful to look at, with smooth, detailed animation complimented by original and imaginative character designs. In this age when Disney seems to have once again converted entirely to CG, and Studio Ghibli’s future is in doubt, The Boy and the Beast is one of the increasingly rare films that showcases the timeless beauty of traditional, hand-drawn animation. Unfortunately, not all is beautiful in The Boy and the Beast, as the film does end up suffering from some questionable pacing in the middle section. Without spoiling too much, Ren/Kyuta does find a path back to the human world at one point, and begins to live a double life, one in the human world, and one in the Beast Kingdom. Though this dilemma ultimately does serve the movie well thematically, its execution could have been handled a lot better, seeing as the Beast Kingdom half of Ren’s life goes unacknowledged for a long enough time that you may begin to wonder if its transitioned into a whole new movie (even Kumatetsu is largely forgotten during this portion of the film). However, the film does pick itself back up during the third act, and even packs an emotional punch. It may not be perfect then, but when The Boy and the Beast works, it really works. With Studio Ghibli’s uncertain future, the soul of Japanese animation could easily become lost. But as long as Mamoru Hosoda and company can keep creating films like The Boy and the Beast, then Japanese animation will continue to have some heart. Miyazaki and Hosoda are easily two of my favourite directors in regards to Japanese animation. All of Hosoda’s recent efforts have been immensely enjoyable, it’s fairly hard to pick a favourite between summer wars, the girl who leapt through time, and wolf children, but I think I’d give a slight edge to wolf children since I’m a sucker for turning of age stories and ones that dish out a chunk of character development. He even directed the Digimon Movie, a film that I absolutely loved as a child! 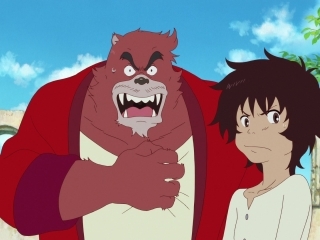 With that being said, it shames me to say that I had no idea that the boy and the beast even existed I don’t know why but despite Hosoda being a favourite of mine, i kind of just forgot about him (as awful as that sounds) 😛 so thank you for informing me on its existence and that it’s a worthy experience to Hosoda’s repertoire 🙂 I’ll definitely watch it per your recommendation!